Welcome to the official website of the Ryeland Flock Book Society Ltd. 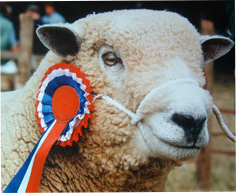 The RFBS is a sheep society established in 1903 for the promotion and registration of pedigree Ryeland sheep. Ryeland sheep are a traditional British sheep breed. 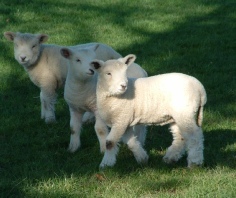 They are well known for producing excellent quality lamb and great tasting meat. 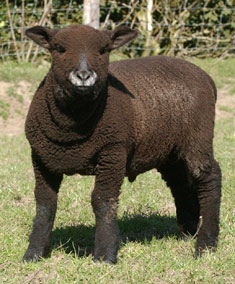 Ryeland lamb is much sought after by rare-breed butchers, top chefs, hotels and restaurants. Hand spinners and weavers also seek out Ryeland wool for it texture and quality. Unlike some breeds of sheep Ryelands are docile and easy to look after, which makes them ideal for smallholders or people new to keeping sheep. Ryeland and Coloured Ryelands do well on a diet of good grass, without the need for additional feed. This means they are particularly suitable for organic lamb production. • Ryelands rarely suffer from foot problems. If you're interested in keeping Ryeland Sheep and would like more details about the Ryeland Flock Book Society or sheep for sale please contact us. The Society's stand is also at many of the Agricultural Shows around the UK and members successfully show their sheep in the various sheep breeds classes held at the county shows and local shows. 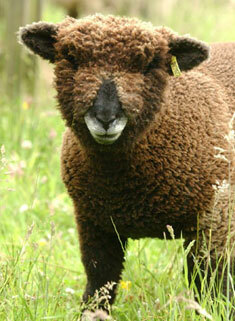 So if you're visiting Agricultural Shows during the year please come and meet the members and their Ryeland Sheep. They'll be happy to talk to you about Ryelands and provide advice on buying and keeping Ryeland sheep.